Homemade By Holman: Mexican Muffins? 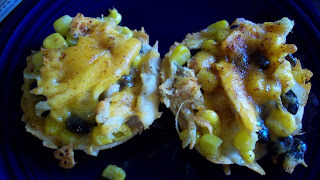 Mexican Lasagna Bites? Layered Taco Cups? I have no idea what to call these things but they are very good. A quick and easy Mexican appetizer that's more substantial (and healthier - in the recipe below) than chips and queso or salsa, etc. Perfect for picky eaters because you can make each cup differently if you want. Plus they are just more fun than a taco. Preheat oven to 350 degrees. Grease a 12 cup muffin pan. Cut out 24 rounds out of the tortillas. I used a juice glass but any cookie cutter or circle shape that is approximately the right size will work. Place 1 tortilla round in each muffin cup. 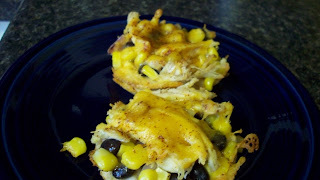 Mix shredded chicken with salsa, add a spoonful of chicken to each cup. Add a sprinkle of cheese to each and cover with another tortilla round. Add another spoonful of chicken mixture to each cup. Slightly mash black beans and mix corn, black beans, and red onion (feel free to add a diced jalapeno here too if you want to add heat.) Add a spoonful of this mixture to each cup. Cover tops with remaining cheese. Sprinkle each muffin with cumin and chili powder. Bake in the oven for about 15 minutes until cheese is melted and bubbly. Top with sour cream, salsa, guacamole or whatever you like.